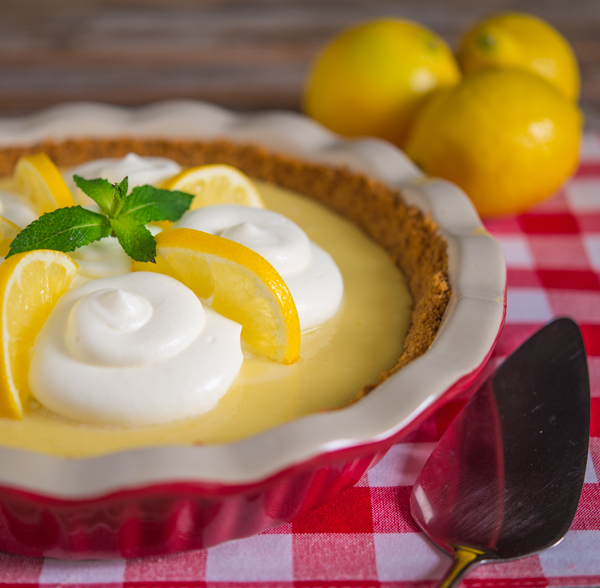 If you live in the deep south and have ever attended a covered dish supper or a church social, I’m sure you’ve encountered a lemon icebox pie. Similar to key lime pie, this dessert shares common ingredients with its cousin. There is nothing original about this recipe so I can’t claim creative rights. I’m sure every mother and grandmother in the south has a recipe similar to this one. There are two schools of thought when it comes to lemon icebox pie…meringue or whipped cream as the topping. People in other parts of the country refer to this dessert as lemon meringue pie and I would agree that meringue may be the more traditional topping. However, I prefer whipped cream and after following Trace’s key lime pie recipe and mixing sour cream with whipped cream, this will always be my topping of choice for this pie. As I mentioned in that post, depending on how much you like and how you apply it, you may want to consider doubling the topping part of the recipe, especially if you pipe the topping onto the pie. This pie could not be easier to make and will delight your family or friends at the end of a picnic or barbeque. This Mississippi boy remembers this pie as the quintessential summer treat. If you need a quick and easy dessert, try this recipe. 2. Mix graham crackers, sugar, and melted butter in bowl. Press firmly into pie pan. Bake for 15 to 20 minutes or until crust starts browning. Remove from oven and allow to cool. Reduce oven heat to 325 degrees. 3. Whisk together sweetened condensed milk, lemon juice, lemon zest, and egg yolks. Pour mixture into cooled pie shell. Bake at 325 for 15 minutes. Remove from oven, cool completely, and refrigerate for 2 hours. 4. Whip heavy cream, sour cream, and powdered sugar with an electric mixer. Spread or pipe (with a pastry bag) cream mixture on cooled pie. Garnish with lemon slices. Serve chilled. Thank you for any other excellent article. The place else may anyone get that kind of information in such an ideal method of writing? Hi, Bill. Tomorrow, I plan to make either this or the lime version mentioned above — I’ll refrigerate it overnight & serve it the following day. If I make the sour cream topping on the day I serve & put it on the pie about 3 hours before serving, will that hold up OK in the refrigerator? I wouldn’t pipe it on, I’d make a double batch & spread it over the pie. I’ve had such success with your tomato pie that I feel very confident about this recipe, but I’m just not sure how long the topping lasts. Thanks very much for your help (& your great blog). I made this pie today, no special reason just because…I love lemon ! My mom also used to make lemon pies/meringue . She was an excellent cook/baker but this was the best I can say in a long time – glad I can’t figure out the calories…smile…thank you, Bill, for sharing your ‘heritage’ with us. I’m making it for my son who does so much for me!!! Thanks for dropping by, Marilyn. So glad you liked the pie. It’s a southern classic! Bill,my husband made these pies in 1964,every Sunday. We would have a contest,between his pie,and my Lemon Merigne. He squeezed fresh lemons and put the white on top after baking. I must say that his was the best.. This is my husband;s favorite pie, above all others. I will have to try your version. Thanks! Bill, I made this today for my girl friends on Friday. We are celebrating two of the lady’s birthdays with lunch and wine tasting at Wolf Mountain Vineyards and then coming over to my house for pie and a card party. Can’t wait to serve it and give my friend, Bill, the credit! I want to go home and make it right now! It is so pretty and lemon desserts are my favorite. Beautiful Pictures. Oh, my … This is my mom’s recipe for Lemon Ice Box Pie … So good! Oh Lordy, gorgeous picture. Makes me want to get in the car and drive to the store for lemons! Thanks for sharing. You should see my bottom lip right now – it’s pouting. 🙁 I want one of these pies! My mother use to make the all of the time except she did the meringue version. I don’t care – whipping cream or meringue, the best parts of the pie is the lemon filling and the crust. Gorgeous pie! I adore ice box pie. I love how sunny this looks and feels. This rivaled my Mama’s lemon meringue pie! Just gorgeous! I’d love to try this. I wanted to comment on how absolutely beautiful your photo is! Looking forward to trying this recipe.